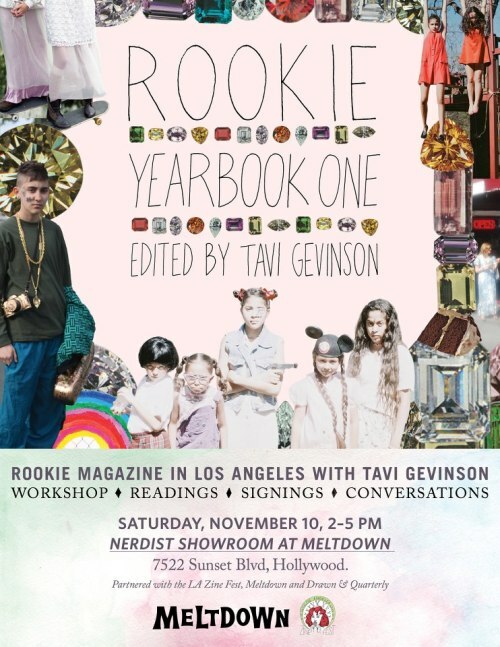 Nov. 10th Join Rookie Mag’s Tavi Gevinson & LA Zine Fest for a Workshop, Readings & More! November 10th L.A. Zine Fest will be partnering up with Tavi Gevinson, Meltdown Comics, Drawn and Quarterly to host a zine making workshop at the ROOKIE reading! You’ll get to make zines in a self-lead workshop with the LAZF crew, enjoy readings from Rookie by Tavi and get your book signed! It’s going to be an awesome event, and we’d love to see you there.